The J 611 Rides Again! The Virginia Museum of Transportation is pleased to announce that the Norfolk & Western J 611 steam passenger locomotive will have another run. The powerful and sleek Class J passenger locomotives were designed and built in Roanoke, VA in 1950 by the Norfolk & Western Railway. They were known as the finest steam passenger locomotives in the world. The first trip in 2016 will be hosted by the North Carolina Transportation Museum. Using the Norfolk Southern rails it will run on Saturday, April 9 from Spencer, NC to Lynchburg, VA and return, on The Virginian. On May 7 and 8 the 611, The Powhatan Arrow, will return to Roanoke to run half-day excursions from Roanoke to Lynchburg and back, following the Blue Ridge grade. Seating options on all of the excursions include coach, first class and dome cars. A dining car and observation car will also be available. Last year, June 14, 2015, we traveled on the 611 between Lynchburg and Petersburg (see blog post dated June 1, 2015.) The train ride was something to experience along with the scenery between the two stops. Last year all seats sold out in record time, so if you’re interested in this unique train trip make your reservation early. For more information contact the Virginia Museum of Transportation at 540.342.5670 or click here for the schedule and costs. It’s a mode of travel like none other. Roanoke, VA, about an hour west of Lynchburg, is a great spot to spend a day, while staying at The Carriage House Inn Bed & Breakfast. The Roanoke Valley was settled in the mid-1740’s by tradesmen and farmers. Towns formed within what is now the city of Roanoke during the beginning of the 19th century. In 1882 the newly formed Norfolk and Western Railway joined with the Shenandoah Valley Railway, which started the rapid growth of Roanoke. The Roanoke Valley is western Virginia’s center for industry, trade, health, education, travel and entertainment. Choose from visiting the Blue Ridge Parkway, the Science Museum of Western Virginia, the Taubman Museum of Art, the History Museum of Western Virginia, Mill Mountain Theater or the Grandin Theatre (see our blog post published 6/16/2015), Explore one of the many delicious restaurants in the Square or the farmer’s market. 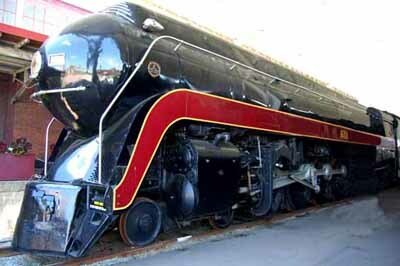 Two of our favorite places to visit are the O. Winston Link Museum and the Virginia Museum of Transportation. The O. Winston Link Museum is located in Roanoke’s historic N & W Passenger Station. Between 1955 until 1960, Brooklyn photographer Winston Link traveled throughout the mountains of Virginia, West Virginia, Maryland and North Carolina photographing and documenting the end of the steam locomotive era of the Norfolk and Western Railway. The last major line to exclusively operate under steam power the photographs are striking, contemplative and amazing. 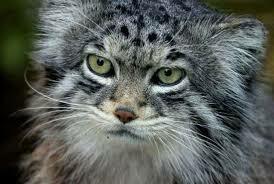 Over 2,400 images were captured during those five years. More than 250 dramatic black and white and color photographs are displayed along with exhibits describing the history of the N & W Railway. Artifacts, films, recordings, maps, dioramas, machinery and histories of the people who made up the N & W Railway along with people who lived along the railway line are displayed. The “Live Storage area” is the chance to view photographs in the collection that are not currently on exhibit. Located just a short walk from the O. Winston Link Museum is the Virginia Museum of Transportation. The museum contains approximately 2, 500 objects and artifacts. The crown jewel of this museums collection is the recently restored, refurbished and sometimes running Norfolk & Western Class J #611 Steam Locomotive. We had the opportunity and pleasure to ride one of the 611’s runs between Lynchburg and Petersburg in June (see blog post published 6/1/2015). What a exceptional way to spend a day, traveling as long ago across the countryside of Virginia. The Virginia Museum of Transportation also has exhibits on cars and other vehicles dating back to 1904, an Aviation and Rail Gallery, along with examples of various train cars, locomotives, trucks, automobiles, buses, fire trucks and anything transportation. The O. Winston Link Museum is located at 101 Shenandoah Avenue, N.E., 540.982.5465 or www.linkmuseum.org. 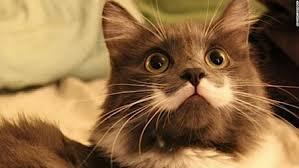 It is open Monday-Saturday 10-5 and Sunday 12-5. The Transportation Museum of Virginia is located at 303 Norfolk Avenue, S.W., 540.342.5670 or www.VMT.org. Both museums charge an admission fee. Joint tickets are available for purchase. With so much to see and do in Lynchburg and the surrounding areas you should add an extra day or two to your visit here. Call 434-846-1388 to make your reservation or book on-line. 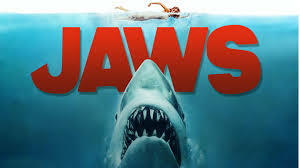 Grandin Theatre shows vintage movie, Jaws! 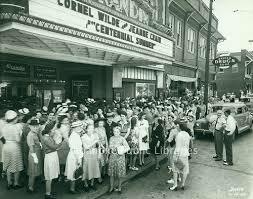 In 1931 construction began on Roanoke’s Grandin Theatre. The movie palace opened its doors in 1932 where shows were 25 cents for adults and 10 cents for children. The first theatre in Roanoke to show “talking pictures” it operated as a cinema for over 40 years before it closed (for the first time) in 1976. Reinventing itself as a live theatre, until 1985, it produced shows, screened classic movies and art films, hosted musicians and comics. The theatre closed again in 2001. In late 2001 the Grandin Theatre Foundation was formed. An aggressive funding campaign was launched and in October 2002 the theatre was able to reopen after raising the funds to buy and renovate the theatre. Theatre history has been taking place ever since. On Saturday, June 20, 2015 at 11:59 PM the Grandin Theatre will show Jaws, to celebrate the movie’s 40th anniversary! Do you remember when Jaws was first shown? Does the opening music and scenes of vicious sharks remind you of when you were afraid to get into the water? Did you imagine yourself assisting the police chief, a marine scientist and a grizzled fisherman when they set out to stop the great white shark menancing the small island community of Amity? The show is free and will only be shown at 11:59 PM on the 20th of June. 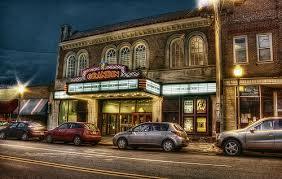 The Grandin Theatre is located at 1310 Grandin Road SW, Roanoke. Call 540.345.6177, if you have any questions. 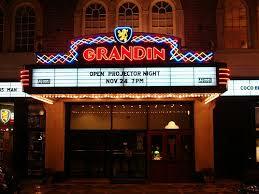 Prior to the movie you should explore Grandin Village, which surrounds the Grandin Theatre. A revitalized business district that was formed in the 1920’s is now home to the Roanoke Natural Foods Co-op, a Saturday farmer’s market, boutiques and the farm-to-table hot spot, Local Roots restaurant. Serving modern American cuisine and using as many sustainable, organic, local and ethical meats and vegetables as possible the food does not disappoint. Preferring small batch, family-owned wines, the wines served are of great flavors and do not impact adversely upon the earth. The menu varies almost daily, based on what can be sourced locally, but always includes petite, modest and substantial dishes. A chef’s tasting menu can be arranged with prior reservation. Call for more information 540.206.2610. Located at 1314 Grandin Road SW, Roanoke, VA. Enjoy your dinner and a show!